Groundbreaking ceremony at Mississippi’s Camp Kamassa in May 2018. In Mississippi, children and adults with disabilities and serious illnesses will soon have a summer camp of their own—one built with their needs in mind. For years, groups that support children with cancer, muscular dystrophy, sickle cell disease and other illnesses have rented facilities to set up camps, which presents accessibility and scheduling challenges. With the support of HOPE, a community development financial institution (CDFI) that serves Alabama, Arkansas, Louisiana, Mississippi and Tennessee, the Mississippi Toughest Kids Foundation (MTK) is changing that. With financing from HOPE and labor provided through the U.S. Air Force’s Innovative Readiness Training program, the foundation is building Camp Kamassa, the state’s first fully accessible camp, in Crystal Springs, Mississippi. The project was made possible through Uplift America, a public-private partnership of the U.S. Department of Agriculture (USDA), philanthropy and the financial sector. It provides long-term, low-cost financing for community lenders such as CDFIs to facilitate community projects like schools, health clinics, libraries, municipal buildings and child care centers in underserved rural communities. Many of these areas are experiencing persistent poverty: 20 percent or more of their populations have lived in poverty for at least 30 years. Through Uplift, the first five years of the USDA loans are guaranteed by Bank of America. Seven private foundations contributed to a grant pool known as the Uplift America Fund to help the re-lenders build their capacity. Right now, summer camp programs for children and adults with disabilities and severe illnesses do not have a permanent home in Mississippi, forcing them to rent space from other facilities, which are not often built for their needs. Sharing space with other camps means these programs are frequently held during the first weeks of summer, when some attendees are not yet out of school, or the end of summer, when some attendees’ classes have already started. Not only will Camp Kamassa provide dedicated, accessible space year-round, it will also have medical facilities so campers can attend even if they must undergo routine treatments. The camp will be available to rent for other groups, but it will be unique in its accessibility to people with disabilities. HOPE’s investment will have positive economic impacts on the community surrounding Camp Kamassa. Copiah County, southwest of Jackson, is a persistent poverty community where 28 percent of people live below the poverty line. By bringing a camp—which is expected to host programs all summer and on weekends the rest of the year—into the community, a steady stream of visitors will start spending time in the surrounding towns. MTK expects many parents to stay in Copiah County when their children are at camp or stop for a meal on the way to and from camp. Camp Kamassa’s construction will include local materials, and Air Force personnel who are traveling to Copiah County to build the site are already staying in the community. But the project’s impact will extend outside the county borders to help families across the state, many of whom face steep medical bills and other financial challenges. 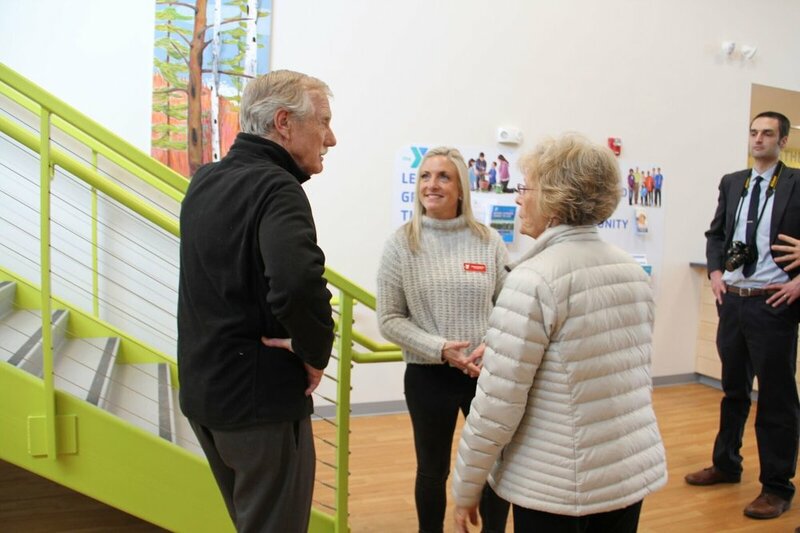 Mary Kitchens, whose son survived kidney cancer as a child, founded MTK in 2008 with the goal of building a camp for adults and children with special needs, a dream that eventually became Camp Kamassa. For years, the Kitchens family was involved in Camp Rainbow, a camp for children with cancer, which never found a permanent home of its own. Camp Rainbow rented locations across the state, none of which was built intentionally for children with cancer. They realized if Camp Rainbow was facing these challenges, other similar programs were likely dealing with them as well. MTK secured the labor for Camp Kamassa through the U.S. Air Force’s Innovative Readiness Training program, which lends airmen to community development programs to prepare them to build structures quickly. But the foundation struggled to find financing for building supplies. Many banks were reluctant to lend the full amount needed because MTK was a relatively new foundation whose long-term plan relied on other nonprofit groups renting the camp, and whose clients had high health care costs. HOPE made a $2.7 million loan to help get the camp up and running. Another financing partner on the project was Fahe, one of HOPE’s partners that works to eliminate persistent poverty in Appalachia. MTK broke ground in May 2018. Camp Kamassa is on track for its first camp season in 2020. Construction at the Lake Andes school campus in April 2018. Public school students in Lake Andes, South Dakota, will soon attend classes in state-of-the-art facilities in the heart of town. For years, local leaders have wanted to upgrade the district’s outdated buildings by renovating the elementary school and expanding it to house the junior high and high schools, now located in a separate building across town. With the support of two community development financial institutions (CDFIs), the Andes Central School District has broken ground on its new, combined campus. Lake Andes is a town of about 850 people, 29 percent of whom live below the poverty line. All of the students in Andes Central Schools are eligible for free lunch. Located on the Yankton Indian Reservation 95 miles southwest of Sioux Falls, the community has a large Native American population: 40 percent of residents and 70 percent of students in the school district are Native American. Built in the 1950s, the community’s schools have needed renovations for years. But financing for the $13 million project has been hard to obtain because of difficulties raising property taxes in low-wealth communities and on Indian Reservations. The two CDFIs involved—Dakota Resources and Rural Electric Economic Development Fund (REED)—solved that problem by agreeing to provide loans of up to $4,875,000 each. The school district is funding the remainder of the project. Renovations include adding 55,000 square feet to the elementary school and remodeling 24,000 square feet of existing space. When it is finished, the renovated school will include new classrooms, science labs, two gymnasiums and space dedicated to industrial arts. For the CDFIs, this sort of technical education is one of the highlights of the project. Teaching students technical skills could help retain the area’s population and stabilize the region. The school district broke ground on the renovated school building in the summer of 2017. Construction is on track to be complete in late 2018. Camp Kamassa, in Crystal Springs, Miss., is the state’s first fully accessible camp for special-needs children and adults. Built in a county whose poverty rate is 28 percent, the 326-acre camp will include a sports field, pool, amphitheater, and nature trails. A county in Mississippi with a 28 percent poverty rate is about to boast the state’s first and only year-round, fully accessible camp for disabled children and adults. A rural county in South Carolina will soon have a dedicated high school to prepare students for health careers. 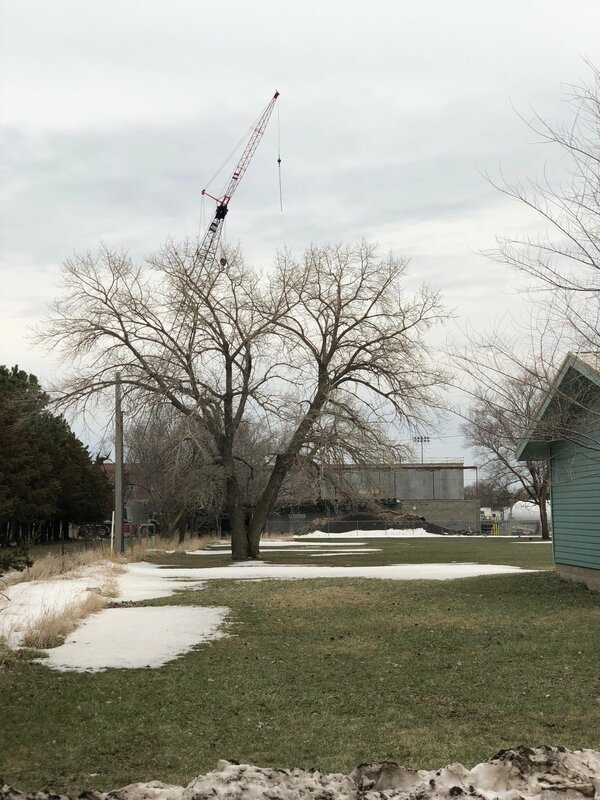 In South Dakota, dilapidated school buildings in a county that’s 43 percent Native American are to be transformed into state-of-the-art facilities. These are among 100 projects that have gotten off the ground through creative efforts to aid persistently poor counties by unlocking as much as $423 million from government and private sources. Americans in high-poverty rural areas will benefit from community projects now in the pipeline, including health clinics, hospitals, assisted-living homes, schools, child-care centers, recreation and tourism hubs, and other facilities and programs. But funding alone isn’t moving shovels in these small towns. Mission-driven organizations known as community-development financial institutions — or CDFIs — are behind the progress. They consist of local experts who know what their neighbors need and who have the relationships and knowledge to tailor solutions to specific challenges in their communities. That’s why the Mary Reynolds Babcock Foundation, which I head, has been supporting an effort known as Uplift America, which seeks to make these organizations stronger so they can use their expertise and relationships for the greater good. 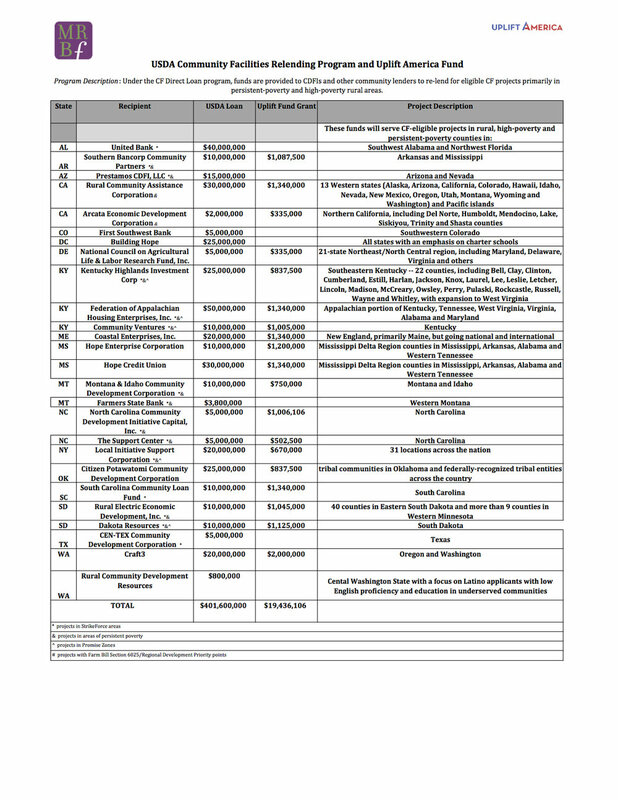 The partnership just published a progress report detailing the scope and geography of these local lenders and the much-needed projects they’re financing. It is worth reading for all grant makers concerned about advancing America’s too-often-neglected rural poor and middle-class residents. A new United Nations report finds tax cuts for the ultrarich coupled with erosion of protections for low-wealth and middle-class families are exacerbating wealth inequality and extreme poverty in the United States. In this climate, it is vital we support the communities most likely to be harmed by these policies and find out what they need to stay on their feet. Places outside America’s cities have vast natural resources, agriculture, and manufacturing businesses, as well as millions of proud, passionate people with rich cultural traditions. Latinos, African-Americans, Asians, and Native Americans are well represented, and in many areas, expanding immigrant populations are helping to keep communities afloat. These places are critical to the country’s overall economic health, but to adapt an old cliché, when America sneezes, rural regions catch a cold. A new Save the Children report finds that while urban poverty remains too high, rural poverty is much more pervasive and persistent. Nearly a quarter of American children in rural areas grow up poor; the figure is one in three or higher across much of the South. This isn’t a new phenomenon. Lack of opportunity, low educational attainment, limited access to health care, slower recovery from recessions, rising income inequality, and other factors have kept too much of rural America in poverty for generations. A paucity of investment and outright neglect have led to decaying infrastructure and inadequate public services, leaving many areas with open sewage, undrinkable water, and crumbling schools. Philanthropy has not been stepping into the breach — at least not at the scale needed to tackle the challenges. 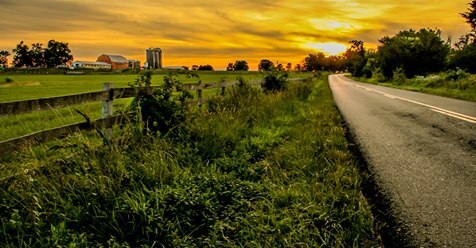 U.S. Department of Agriculture economists analyzed grants from 1,400 of the largest foundations from 2005 to 2010; the analysts concluded that only 5.5 to 7.5 percent of those grants benefited rural counties, even though 19 percent of Americans were living in such places. Researchers also found that the greatest benefits from grant making to rural areas go to counties that already have well-funded nonprofits with the resources to court support from foundations. It’s clear we need to make a shift in how we work. One way to make a huge difference is for grant makers and the government to better tap the role of community-development financial institutions as key players in deploying more assets to rural America. These organizations excel in fighting rural poverty and in working on ways to shape policy, develop leaders, and expand civic engagement. Efforts by these institutions have prevented some communities from becoming banking deserts, where people are likely to resort to high-cost predatory lending. These institutions provide services such as small-business loans, mortgages, financial education, debt consolidation, and financing for projects including affordable housing, schools, and grocery stores. They help individuals, families, entrepreneurs, developers, and municipalities improve their financial situation by providing not just capital but also hands-on assistance and training. What’s more, these institutions often promote potential new growth areas for local economies like renewable energy or cultural tourism. Some educate the public and advocate for policies that offer ladders out of poverty so low-wealth people and small businesses can achieve their financial goals, thereby contributing to the improvement of local economies in general. Increasingly, efforts such as these are being done collaboratively with other nonprofits, all with the aim of making development efforts across the country more democratic. The Bill & Melinda Gates Foundation recently gathered academic, nonprofit, religious, philanthropic, and business leaders to examine the underlying factors of chronic poverty, including social, political, and economic forces. Among the recommendations issued by this collective effort, the U.S. Partnership on Mobility From Poverty, is to give residents of poor rural areas better access to affordable, responsible financial tools. Specifically, the partnership recommends strengthening and expanding the constellation of 1,100 financial institutions serving people and places neglected by big banks. The group cited Uplift as an example of "the potential for collaboration among financial institutions, government, foundations, and CDFIs in expanding access to financial services in economically distressed areas." In today’s turbulent political and economic environment, efforts like Uplift America face new obstacles. Since the effort began, the leadership at many federal agencies has changed greatly. There is also a lot of uncertainty about policies and regulations in the financial world. While we hope to develop more collaborative efforts like that one, they may look a little different — and maybe that’s a good thing. What is clear is that the demand and the need remain high. We hope to attract new sources of flexible capital that can deliver benefits to rural areas, involve smaller lenders, and seed a wider range of projects both large and small. One ingredient in future partnerships will remain constant: trusted local lenders that are mission-bound to improve their communities and, with the right kinds of investment, can actually get it done. In the meantime, the Babcock Foundation will continue to provide grants and program-related investments to community-development financial institutions in rural areas that have contributed so much to America but never gotten fair recompense. Regardless of the shifting political winds, we hope more foundations will recognize that supporting these trusted institutions is a straightforward way to increase economic opportunity, improve the quality of life, and help realize the immeasurable potential of rural America. 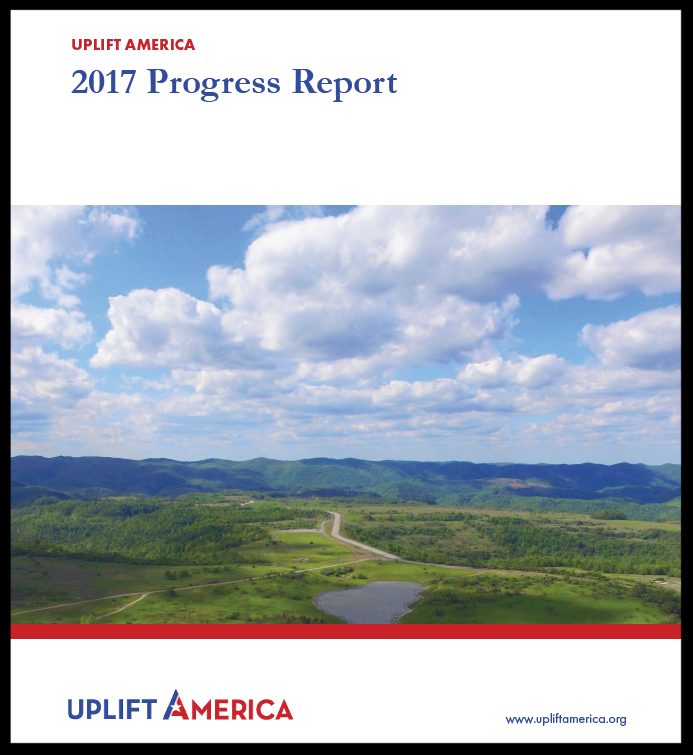 Yesterday, the Washington Monthly published an article on Uplift America as part of its "Successes of Philanthropy" project. 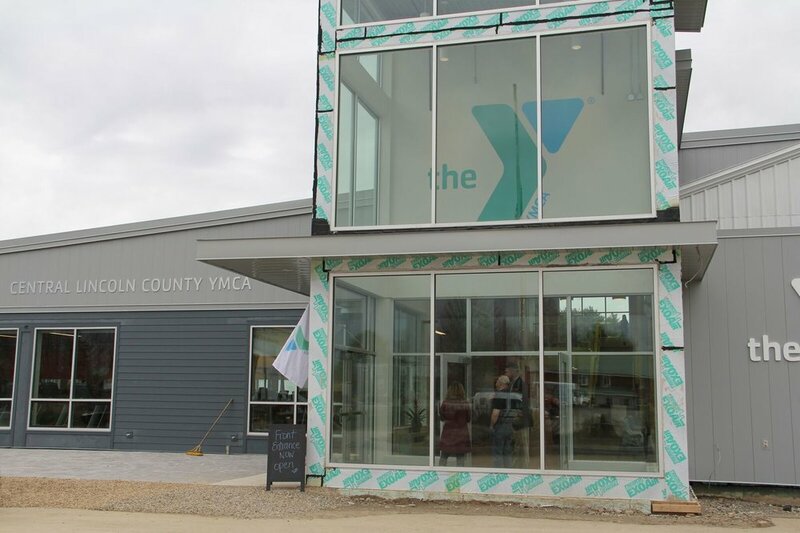 The article, written by Susanna Hegner of the Mary Reynolds Babcock Foundation, discusses how the Uplift partnership is increasing economic opportunity in rural areas and highlights grantees' projects across the country. Representatives from the USDA, Bank of America, the Mary Reynolds Babcock Foundation, Prosperity Now, community development financial institutions and philanthropic partners launched the Uplift America partnership at USDA headquarters on July 19. USDA Under Secretary for Rural Development Lisa Mensah, MRBF Board President Dr. James Mitchell, USDA Secretary Tom Vilsack, MRBF Executive Director Justin Maxson, MRBF Communications Officer Susanna Hegner.